We serve a select group of successful professionals and business owners who among other things want to face the future with anticipation rather than apprehension. Our clients all have a bucket list to some degree and want some sense of confidence and predictability that they will be able to check off those boxes in the future. Some want to spend time with family; others seek work optional lifestyles, and the rest seek to secure their family legacy. We have developed and refined a process called THE QUINT PROCESSTM that allows us to put all the pieces of the puzzle together as our clients’ lives unfold and their needs evolve. Investment advisory services offered through Xceed Capital Management, LLC registered investment advisor. 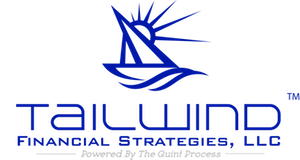 Tailwind Financial Strategies, LLC and Xceed Capital Management LLC are independent companies.